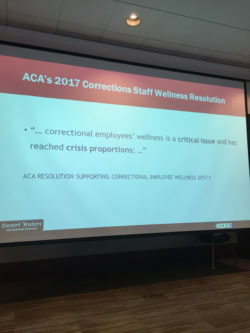 I am recently back from giving a presentation on “Stress, Trauma, and Suicide” for the National Symposium on Correctional Worker Health in Saint Louis. 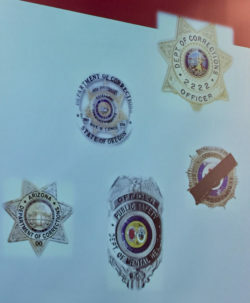 The topic is a grim one and the statistics on correction officer suicide are daunting. Some studies show that corrections staff have rates of PTSD several times higher than combat veterans. I am always excited to be on a program like this one because I know that the Social Resilience Model that I bring offers a tangible, resilience-oriented intervention that includes practical skills for building nervous system stability, which, in turn, builds better physical and emotional health. When COs learn to pay attention to the body’s signs of distress early in the process and then use SRM’s RZone skills to decrease that activation greater hardiness is developed in the nervous system. With practice…and the brain’s neuroplasticity…the skills “wire in” a deeper Zone of Resilience. The Resilient Zone is that band of nervous system rhythm in which individuals are able to respond to stressful events rather than reacting in ways that get them into career-risking behaviors as well as stress-related illnesses. It is from inside the Resilient Zone that we can each be our best selves. At the conference I had the opportunity to hear from the CO union (Teamsters) representatives from the Northwest. It was gratifying to hear their concern for the negative health indicators and their determination to promote wellness programs. 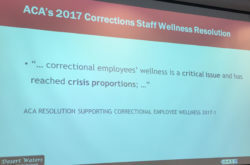 We have found that the key to getting the buy-in and active engagement of correctional staffs is the Social Resilien ce Model’s tangible, easily-learned RZone skills. These skills can be used for self-care as well as peer-to-peer and with family members. The neuroscience-based information that goes along with the skills helps depathologize reactivity and motivate skills practice. Training CO staff as RZone trainers is always a part of our projects and it creates scaleability and sustainability. In the spring semester of 2017 TGW staff conducted a two-part workshop at John Jay College of Criminal Justice for students (cadets) who are training to become corrections officers and we oriented these students to the SRM neuroeducation and RZone skills. Direct application always makes it all come alive and the cadets had the opportunity to use the skills first for self-care and later with peers. There was a lot of “high fiving” as they saw the results of their practice with peers. As neuroscience information increasingly contributes to understanding of key aspects of human behavior we have a much richer way to approach what have been intractable challenges. When individuals, organizations, communities, and even countries include this information in their way of understanding the problems that limit potential a new opportunity grows…one that builds dignity , hope, and generativity.